Darth Vader, disheveled and war torn. Astonishing giclee print from the Star Wars universe. Hand-numbered limited edition of only 95 pieces, signed by the artist! Printed on canvas, it measures 18-inches tall. 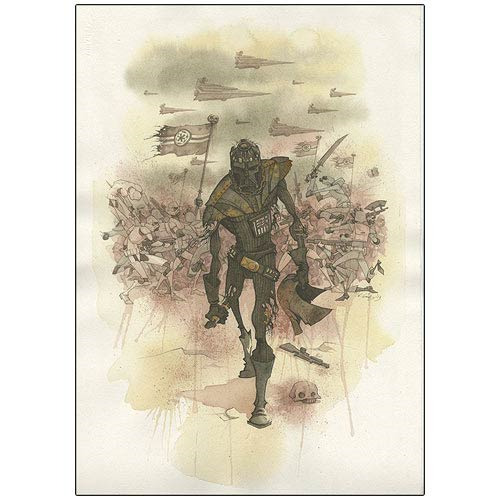 Star Wars Darth Vader's Helmet Canvas Giclee Print from Acme Archives presents the Dark Lord of the Sith, disheveled and war torn, walking from a large battle with part of his helmet in hand. Measuring 18-inches tall x 14-inches wide, this astonishing unframed giclee is a hand-numbered limited edition of only 95 pieces that's printed on canvas and signed by the artist, Gris Grimley. A terrific find for devoted Star Wars fans, it includes a certificate of authenticity. Gris Grimly can be best described as a storyteller. For more than a decade, his distinctive style and wide selection of media have captivated a variety of loyal fans worldwide. Originally recognized for his dark yet humorous illustrations for young readers, Grimly has transcended beyond the realm of picture books through writing, gallery art, and film.